From the darkest corners, from the deepest pools and from dungeons thought only to exist in nightmares come the Advanced Fighting Fantasy monsters - the downfall of may a brave warrior. Two hundred and fifty of these loathsome creatures from the wild and dangerous worlds of Advanced Fighting Fantasy are collected here - some are old adversaries, many you have yet to meet - each of them described in minute detail. 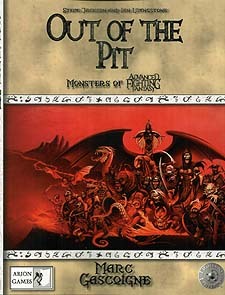 An indispensable guide for Advanced Fighting Fantasy adventurers.